Many establishments out there are keen to create a more environmentally sustainable workplace but are unsure of how to achieve this in line with their business operation. As is often the case, there are simple things that can be done to make a difference. For example, the use of reusable cloth wipes instead of one-use paper products for various cleaning purposes is a simple way to create less waste. A clean and neat kitchen is an essential part of running any restaurant or café. From a customer perspective, maintaining high hygiene standards while the kitchen is in use and when cooking has been completed is essential. If the kitchen isn’t kept clean, bacteria can develop and vermin can be attracted to the premises. There are a number of chemicals used for cleaning kitchens, each specific to a certain area. Chlorine bleach and iodine are very effective when used to disinfect work surfaces and cooking equipment. Alkali detergents are used for heavy duty requirements. Acid based cleaners are used for cleaning ovens, floors and walls. Regular detergents can be used in many areas, from washing to general cleaning. These chemical cleaners are available in industrial strength and are preferable to those commercially available for home use. In general industrial strength cleaners have less “fillers” and are more effective than their commercially available cousins. While paper based products can be used for cleaning in a kitchen, these products need to be disposed of after use and generally cannot be recycled effectively. Paper based wipes are less durable and are a one use only type of cleaner. Continued use of these products can lead to bacterial contamination of sterile areas. 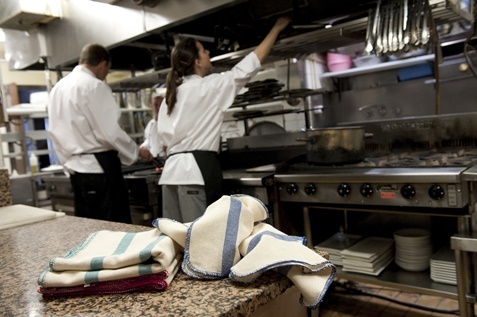 The use of cotton or polyester wipe cloths provides a more hygienic solution for keeping a restaurant clean. A systematic approach has been developed for the use of cotton cloth wipes. Different coloured cloths help identify where they should be used so cross contamination is minimised. Cotton food wipes come in four different colours to determine where in the kitchen they should be used. Green wipes are used in areas where there is preparation of raw food. Blue wipes are used for handling of cooked food. Pink wipes are for general cleaning in food establishments. White cloths are for general use. This designation of colours meets the requirements of the HACCP Food Safety System and helps a restaurant show its compliance during an audit. Using a cloth for cleaning is not limited to benches in the kitchen – cotton cloths are very effective for drying of dishes and detailing of glassware. For drying of dishes nothing beats a cotton tea towel, which also has the advantage of being ideal for use as a general cleaning cloth. In the case of detailing of glassware, in particular wine glasses, the best solution is a slightly damp polyester cloth. While cotton cloths are effective in glass detailing, polyester cloths have the advantage of leaving no lint. For general restaurant use, polyester cloths have the disadvantage of not being able to be used near hot surfaces as the polyester will melt. However their inherent natural properties make them an ideal cloth for cleaning up. Cotton cloth wipes are made from natural fibres, while micro-fibre is a synthetic product made from very fine polyester and polyamide threads. Visually, there is little difference between a micro-fibre and cotton cloth, both have a similar texture and feel. However there are some significant differences between the products. Micro-fibre fibres are thinner than a strand of hair, in comparison to cotton which is a thicker thread. Micro-fibres have strong elasticity content, and resist shrinking or stretching. The angled edges of the fibres contain deep splits to attract moisture and dirt, leaving no residue after cleaning. The dirt is trapped and held in the fibres until the cloths are washed. A micro-fibre cloth can be washed between 100 and 500 times in cold or warm water, but to achieve thermal and chemical disinfection need to be washed in an Industrial Laundry operation. Cotton is the most widely used textile fibre in the world. Natural cellulose is spun with long staple cotton and woven into a 100% natural cloth. The result is a soft and absorbent cloth that will not cause scratching, ideal for glass cleaning. Once this type of fabric has been through its first few washes it becomes more absorbent but has the disadvantage of potentially leaving lint when used as a glass wipe. Both micro-fibres and cotton absorb well. Cotton can absorb 3 to 6 times its weight, and micro-fibre can absorb 6 to 10 times its weight. Micro-fibre cloths can be used damp, but should not be used wet. If a micro-fibre cloth is too wet, the elements of the fibre designed to hold dirt will be filled with liquid and the cloth will be ineffective. While both cotton and micro-fibre are soft and unlikely to scratch, in general the natural fibres in cotton are less likely to scratch than synthetic fibres. Knowing the different types and uses of Cotton Wipes are very important. Alsco’s range of wipes uses both cotton and micro-fibre fabrics. For more information or to trial Alsco wipes, visit www.alsco.com.au or call 1300 300 953 and our friendly representatives will help you.